Vosges Haut Chocolate is an upscale chocolate company that takes chocolate lovers to a whole new world of loving chocolate. Perhaps most famous (well, at least in Bellingham!) for their Bacon Chocolate (that’s right … bacon + chocolate. Apparently, it sells.) 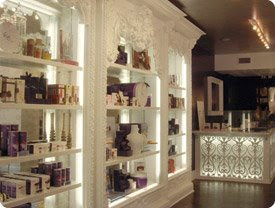 Their boutiques are located in New York, Chicago and Las Vegas. We’re talking classy truffles, chocolate bars, gourmet wine and cheese pairings and over the top gift boxes in the boutiques. My favorite product only costs $375.00 (cough, cough). Of course I won’t buy it, but a girl can dream right? It’s a gift box called the Sensory Collection: Chocolate for the Nose. It’s a complete guide on how to taste chocolate. It comes with chocolates from 15 different countries, 42 different aromas to smell and a guide book that includes the history, tasting and making of chocolate. How decadent would this be to have for your next girls night? The kit promises to ‘unlock the mysteries of Mother Earth’s magical cacao’. Sold! That’s hilarious! My husband just brought me back a bar of the Vosges Mo’s Bacon Bar Chocolate that he found at Cost Plus yesterday. It was, different. Not as horrible tasting as you might think. But not good enough to eat the whole bar. Mmmmmm…decadent chocolate, hold the bacon! I’ve had their bacon chocolate bar!!! A local deli sells them. The salty, smokiness is mostly what you get from the bacon–and combined with the rich, sweet chocolate….a decadent taste experience. It’s brilliant. The Gatsby collection is my favourite!! I also love the Fleur collection, Viola truffle, Hip-Hop collection and La Parisienne Couture Cocoa. I have yet to try anything that isn’t insanely divine! I think that I saw the boutique in Las Vegas on a TV Show (Either Food Network or the Travel Channel) But they mentioned the bacon chocolate, so I guess it is a seller everywhere! Yum! I can’t imagine spending $375 on such a luxury but it would be so wonderful to try all of those chocolates!! You always find the coolest stuff! I want one too! I always say,if you’re going to dream, dream big! That Chocolate Kit sounds so awesome!